My husband, Robert Currey, founder of Currey & Company, and I have a pair of lamps that might be called the very first “Currey lamps.” He made these diminutive lamps from empty beer cans when he was about ten years old. Robert’s father was not much of a regular drinker, but when he did want a beer, he apparently preferred a “Falstaff” brew. (I Googled it and Falstaff Brewing Corporation still exists today although the namesake beer is no longer in production.) 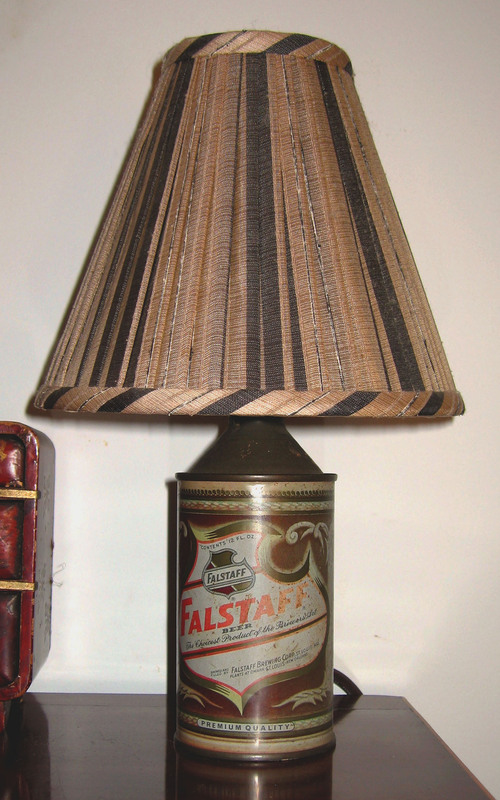 Robert was quite taken with the way the Falstaff cans looked and decided he would make a pair of lamps out of them. His first attempt to weight one of the cans down by melting lead (in one of his mother’s saucepans) and pouring it into the empty beer can didn’t work so well as the hot lead melted the paint off the can. So he tried again, by putting the can in a pan of water in the freezer. This time, when he poured the hot lead into the can, the paint did not come off. Once wired the Falstaff lamps were shaded with lampshades bought from Woolworth’s in downtown Chattanooga. They were first used on a dresser in the Lookout Mountain bedroom Robert shared with his brother, Hal. They have followed us around over the years and now reside with us in our old house in Sparta, Georgia. And there you have the real story of the first Currey table lamps – except for the part about his mother giving him hell over ruining her good saucepan. This entry was posted in Currey & Company, History and tagged Lighting, Table Lamp on May 20, 2014 by Currey & Company. Excellent Design i love it.